Recently, after collecting my local CSA share, I began thinking about really local produce and decided to visit the various “farms” and produce stands actually in West Philly. What I found was pretty cool. There are, at least, 6 in West (and Southwest) Philly that sell produce at their own Farm Stands. Some also sell at farmer’s markets or through venues such as our very own Mariposa Coop. I was able to visit three of them: Earth’s Keepers at 51st and Kingsessing, Urban Tree Connection, at 53rd and Poplar and The Farm at Bartram’s Garden at 54th and Lindberg Blvd. 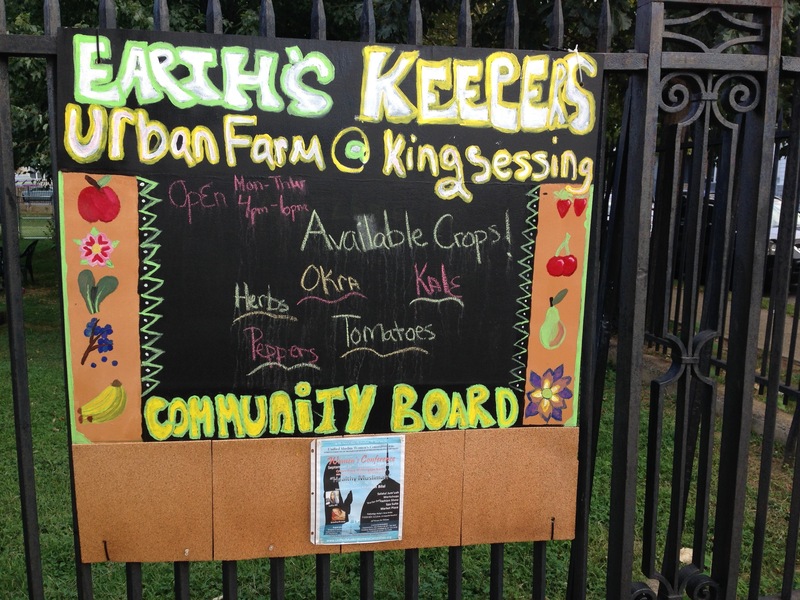 Earth’s Keepers is right next to the Library on 51st Street (between Chester and Kingsessing) It not only has 12 raised beds of vegetables, a strawberry patch and an orchard, it also has a passive solar heated hoop house for extending the growing season. I bought kale and okra there- both were outstanding. You can stop by there Monday through Thursday, 4-6:00 PM to buy great, really local produce. The program has worked with and trained many high and middle schoolers in gardening/farming skills, as well as nutrition and healthy food preparation. Alia Walker is the coordinator and head farmer/educator. My next visit was to the Urban Tree Connection Farm. I was met there by Stan, the director who has been with the project since its inception 15 years ago. Back then is was a response to the drug related killings of six young men from the neighborhood which was pocked with abandoned lots full of rubble and overgrown with trash and weeds. One of the larger lots was obtained and with the community’s help turned into a memorial park, with a small stage, open grass and beautiful shrubs. Stan was a professor of architecture at UPENN previously, who left that profession to address the problems in his community. He was not a farmer, or even a gardener, so when someone suggested adding a few raised beds to lot adjoining the original memorial park, he declined. Overtime he was convinced to give it a try and 8 years ago UTC (UrbanTree Connection) got volunteers to install several raised beds. That’s when they came out of the woodwork! Several older women from the surrounding homes came out to give advice and eventually to have beds of their own. Following that, those same women started beautifying the small gardens right outside their homes and the whole block of houses began to seem more like garden apartments than subsidized housing. 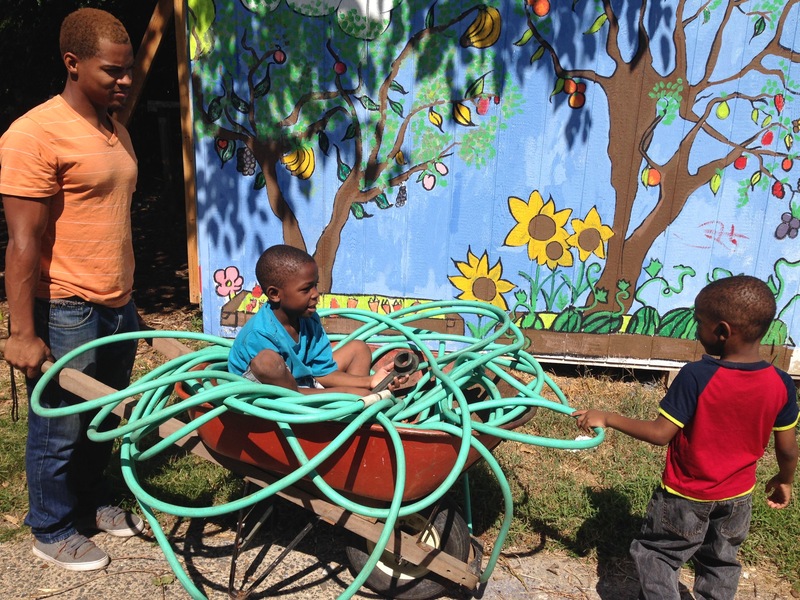 There is now an actual farm in the center of one block, that employs two farmers and 8 neighborhood youth every summer. Stan repot that the farm sells $46,00.00 of produce a year; some at their own stand (at reduced prices for neighborhood folk), at the Rittenhouse Square Farmer’s Market, and to local farm to table restaurants! Last, but not least, I visited The Farm at Bartram’s Garden. Its full name is The Farm and Community Resource Center. This is the largest of the local, local farms. It has an orchard, a large raspberry patch, an actual 4 acre field where many vegetable grow, a passive solar hoop house and oversees approximately 10 raised beds that community members can “rent” for $15.00 a season. The raised beds fee comes with replenished soil, the use of tools and some seedlings, so it is a pretty good deal. They work in collaboration with several groups; Parks and Recreation, the Horticultural Society and the Urban Nutrition Initiative (UNI). Through UNI many neighborhood youth get experience farming and selling produce as well as nutrition and cooking. I hope to make visits to the other 3 farms soon. Here is a list of where and when to buy the excellent, super local produce from farm stands just a block or 3 away from where you live! We’re less than a week away from the longest day of the year and plants are growing like crazy. If you’re regretting the fact that you don’t have a plot at a community garden, it’s not too late get one and plant some late season vegetables. If that’s too tall an order it’s never too soon to start planning ahead for next year. 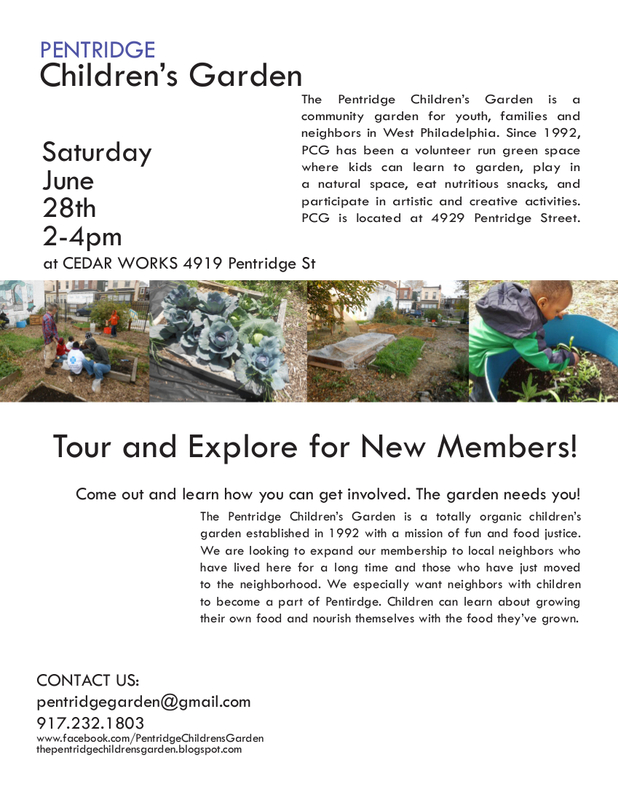 Check out the Pentridge Children’s Garden on June 28th or use this handy directory to look for other plots around West Philly. Block Party or ‘Bloc Party’? June is here and all around the neighborhood cones and banners are closing off streets for block parties. 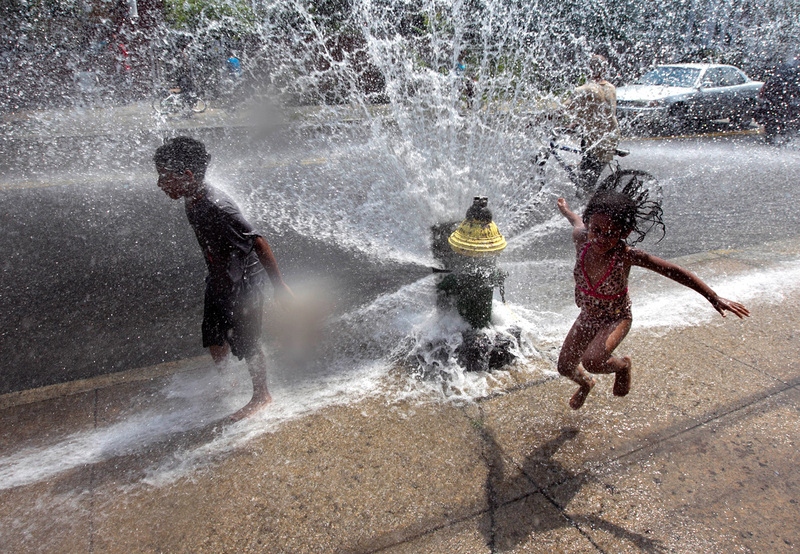 Block parties are high up in my ‘Best Things About Summer’ list along with ripe tomatoes, water balloon fights, and porch fans, but this year there’s another type of block party that’s even more exciting. I’m talking about the ‘Bloc Party’, an effort to mobilize the hundreds of thousands of people across Philadelphia who have been directly affected by mass incarceration. By some estimates there are over 300,000 people who have served prison or jail sentences in Philadelphia, and when you consider all the people who have seen their friends and family members do time, you have the makings of huge voting bloc with the power to reverse the punitive, racist, classist policies and practices which have caused Pennsylvania’s prison population to balloon from 8,243 people in 1980 to over 52,000 today. This ‘Bloc Party’ is about more than bouncy castles, it’s about ending mass incarceration, stopping the legal discrimination against the formerly incarcerated and breaking the cycles of violence in our communities. To learn more about the Bloc Party attend their free event tomorrow, June 11th from 6-9 pm at The Friend’s Center (15th and Cherry st) or contact the hosting organization The Center For Returning Citizens. For more information on efforts in Pennsylvania to end mass incarceration in and the damage it does to our communities check out Decarcerate PA.
For the City Form needed to get your block closed for a block party go here. What happens when strong social movements put cooperatives on their agenda for serious, structural change? For your mid-week reading check out this infographic outlining racism in the criminal justice system. Any other good racial justice reads for this about-to-be-rainy day? Development on the 5000 block of Baltimore Ave. has become a hot topic in recent months and was the subject of a recent acronym-heavy community meeting co-hosted by the Baltimore Avenue Business Association (BABA) and Cedar Park Neighbors (CPN) and held at People’s Baptist Church (5039 Baltimore). The meeting was called to discuss competing proposals for four “blighted” parcels on the south side of Baltimore Ave. near the intersection of 51st St. There is clearly a huge amount of interest in the future of this stretch of Baltimore Ave, as demonstrated by the standing room-only crowd of well over 100 and the meeting was at times contentious. There is a lot of uncertainty around what may or may not happen with the four properties at issue. One controversial and somewhat vague proposal made by the Baltimore Avenue Redevelopment Corporation (BARC) would have the Philadelphia Redevelopment Authority (PRA) use the power of eminent domain (the power of government to seize private property, under certain circumstances, for public use) to expand the Mercy Wellness Center (5008 Baltimore Ave.), and/or to perhaps build student housing. (There was not much enthusiasm expressed at the meeting for the prospect of student housing on the block.) It was reported, however, that there is no funding for this proposal, and so it is not being formally considered by the PRA at this point. PRA also says that it is open to receiving competing proposals, but has not yet received any. Owners of other properties on the block, meanwhile, expressed that there has been private interest in acquiring and developing the parcels, including by Greensgrow to build a garden center (one of the businesses residents expressed the most desire for in a recent survey conducted by CPN), but that the threat of eminent domain had always prevented any private development plans from going forward. Greatly complicating the discussion was the city’s byzantine process for dealing with blighted properties and the fact that some key decision-makers, most notably Councilwoman Jannie Blackwell, were not at the meeting. A number of people in attendance expressed the desire to engage the councilwoman on this issue. It addition to the conversation about these four parcels, there is a broader issue over the City’s the process by which the City designates properties as blighted, the lack of community input in that process, and the difficulty in reversing a blighted designation once it’s been made. The 5000 and 5100 blocks of Baltimore were originally designated blighted and then were re-certified as blighted in 2005, which appears to keep open the threat of eminent domain. Now, it would take City Council passing an ordinance to un-blight them, even though there seems to be a lot of interest in developing them. In short, the current situation is something of a mess. The good news, though, is that the community is very engaged. If you’re interested in learning more (or perhaps becoming even more confused), there has been a lot of media coverage in recent weeks, including a couple of City Paper articles, one outlining the BARC proposal and response from local property owners and another reporting on the community meeting, and a post on West Philly Local, with responses from the Philadelphia Redevelopment Authority in the comments. FJAR will continue to monitor and participate in this discussion. Stayed tuned to the blog for updates! The existence of a standing Food Justice and Anti-Racism committee at Mariposa is a double-edged reminder. It tells us first of all that our food co-op is paying attention, that we aren’t fooled by race-blind rhetoric and waxy Red Delicious apples from New Zealand. We know that racism has been institutionalized and requires an institutional response. We see the way an unjust food system supports and is supported by structures of oppression that favor whiteness, richness, patriarchy and heterosexuality. But FJAR should also remind us that the co-op’s participation in the struggle for justice is only a potential and not a guarantee. That potential is based on the fact that democratically owned businesses can pool the resources and power of individuals to meet community needs, but if nothing is done with that power, or if the community being served is the same community privileged by the status quo, then the co-op is just one more place to buy in and sell out. FJAR exists because we have to be proactive in making sure that our co-op lives up to its potential. That’s one of the reasons why the Co-ops and Social Justice Book Club formed in July. We wanted to understand how past and current co-ops have supported, participated in, and interacted with social justice movements because we want Mariposa to be fulfilling our potential. We started off with Food Co-ops in America by Anne Meis Knupfler and an article on African American cooperatives by Jessica Gordon Nembhard. In September, we read What Then Must We Do? by Gar Alperovitz, which collected efforts across the country to show the ways in which we are already building alternatives to corporate capitalism. In October, we looked at James Boggs’ ‘The American Revolution’ which offered uncanny predictions of our current moment and abstracted 20th century labor struggles in a way that allowed us to look again at what we value in a workplace. In November, December, and January we worked our way through John Curl’s substantial work of cooperative history, For All The People, which provided a wide lens through which to view the booms and busts of past co-operative movements. Curl’s book reminded us that co-ops, as people-centered businesses, share some of the limitations of people. Unlike corporations (on whom legal personhood is magically bestowed) co-ops are more grounded in their context and more likely to live and die with the generations that created them. Our context at Mariposa is a growing co-op in a changing neighborhood and our next two readings are aimed at grounding us in that context once again. commentary on the relationship between food and gentrification. On March 26 (7-8:30 pm), we’ll explore our own history by way of Andrew Cornell’s Oppose and Propose, which outlines the history of Movement for a New Society, a national movement-building organization that was based in West Philly from the early 1970’s to the mid 1980’s and helped found Mariposa. Read what you want and come if you can because our power comes from our ability to take collective action, and what we learn together is what will make that happen.